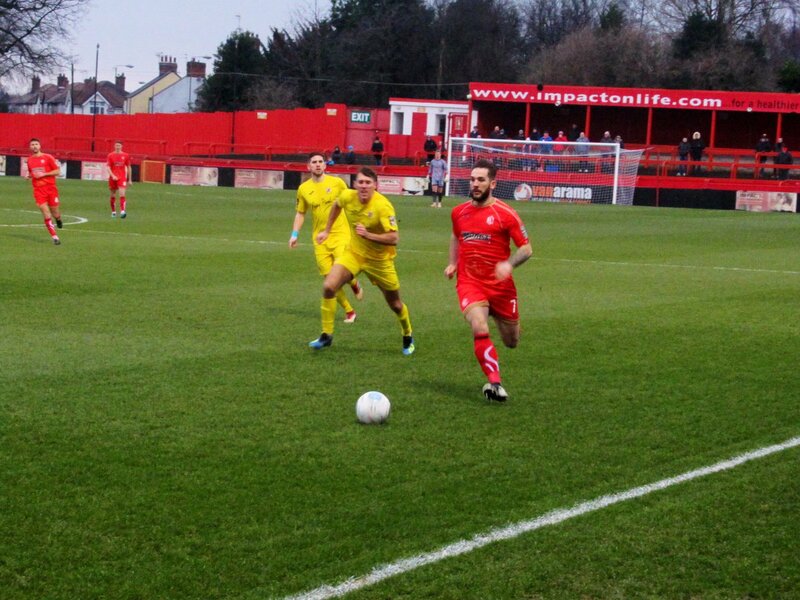 Alfreton Town fell to an 89th minute winner from Daniel Nti, as Brackley snatched all three points at the Impact Arena leaving the Reds still searching for a first league win of 2019; on Saturday afternoon. Billy Heath made two changes with Josh Wilde and Curtis Bateson coming into the side, Josh Clackstone and Jordan Sinnott dropped to the bench. It was a quiet start to the game with the first effort coming from David Lynch from inside the D, the shot looping over the bar. The Reds had an early penalty shout waved away when Bateson's cross towards Reece Styche saw the Reds forward control well before the ball appeared to strike a Brackley player on the arm in the box but the Referee waved away the claims. Alfreton were on top in the first portion of the half with constant pressure from Wilde, Tom Allan and Curtis Bateson as we shifted the balls to the flanks and were attacking with purpose. Allan made a good run with neat feet before he was crowded out in the area. Brackley's response was sporadic with Dean heading a free kick wide of the post before the Saints latched onto a mistake from Curtis Bateson but Lowe's cross from the right couldn't be converted as the ball flashed across the face of goal. Tom Platt delivered a good free kick in towards Allan but the connection on the ball was comfortable for Lewis in the Saints goal. Styche came close as he latched onto a defensive error on the edge of the box but the striker's effort went just over the bar from outside the box. Luke Shiels then headed wide from Wilde's free kick. The game was a tight battle, especially in midfield with both defences staying relatively strong, Martin Riley timed his challenge perfectly on Lowe in the box to prevent a cross. The visitors were pressing towards the back end of the first half with several corners cleared away late on but it was the Reds who had created the better half openings. Brackley started the second half much quicker with Bryne picking out Ndlovu but Sam Ramsbottom reacted well to read the run and intercept. Alfreton's forward play was lacking with long balls often in-accurate and there appeared to be a lack of serious penetration behind the lines with the Reds often relying on set pieces to threaten. Styche fired over the bar on 59 minutes before Bateson's corner was over-hit moments later. The first shot on target came from Brackley on 63 minutes when Carl Baker was denied by a stunning Ramsbottom save. Tom Allan chest controlled a clever lofted ball into the box from Dom Smith, but delayed getting a shot off in the box and that opening went by for Alfreton. Bateson and Richard Peniket linked up well on the edge of the box but Bryne cut Bateson's cross out. Ndlovu rattled the angle of the post from just outside the box in what was the closest effort either side had mustered in the game. The Saints were pressing yet again late on, Wilde blocked an effort from Walker before Shiels stretched well to head away more danger in the Reds box. Ramsbottom denied Ndlovu from close range in the box with his feet before the deciding goal came on 89 minutes when a mazy and powerful run from Lowe on the right who found Byrne who reached the byline and played a ball into Nti who bundled the effort into the bottom corner. Martin Riley had a late chance in stoppage time as he stabbed a Bobby Johnson free kick at the far post wide but it wasn't to be for Alfreton who didn't create enough dangerous chances and will be equally frustrated to lose the game in virtually the last minute of the contest. The Reds will need to pick themselves up again as we make the trip to Aggborough on Saturday afternoon to face Kidderminster Harriers, kick off is 3pm. ATFCXI: Ramsbottom, Smith, Wilde (Johnson 87), Lynch, Shiels, Riley (c), Styche, Platt, Peniket, Bateson (Clackstone 80), Allan. Subs Not Used: Nicholson, Sinnott, O'Brien.